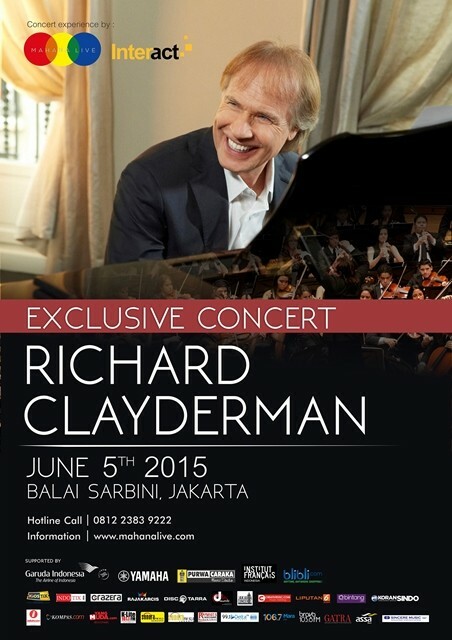 The legend French pianist, Richard Clayderman, will make his second exclusive concert in Jakarta as part of his 2015 Concert Tours, will be performing at Balai Sarbini, Jakarta, on June 5th. Mahana Live & Interact as promoter and organizer says Clayderman will collaborate with Indonesian musician. The audience will get to experience a special performance from the legend and mini strings orchestra for two hours show. Go get your #ClaydermanJKT tickets, now! Get voucher Buy 1 Get 1 free! *Be a VVIP audience to enjoy the concert experience, meet Richard Clayderman upclose and get his autograph at the same time! (purchased via mahanalive.com only).